Any brick company can sell bricks — but not many offer the same range of services as Triangle Brick. Since 1959, our company has been committed to exceptional service in every facet of our business, from mining to production to delivery to design assistance, and everything in between. Learn more about the brick services we offer to our valued customers below, and feel free to contact us with any questions you may have. Whether you’re interested in meeting with our in-house professional designer or taking a tour of our state-of-the-art Brick Design Center and Brick Garden, you can feel confident that Triangle Brick’s design team will work with you to find the perfect brick for your project. 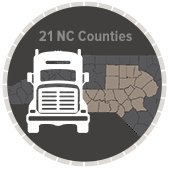 Triangle Brick is proud to offer brick delivery to customers in NC, SC and parts of VA. With our in-house fleet of trucks and drivers, we are able to work with our customers through every step of the process, from ordering their brick to placement on the jobsite. Our customer service team has more than 50 years of experience meeting the needs of residential and commercial customers in over 30 states across the US. Triangle Brick specializes in providing customer-focused field services through our local brick sales representatives. Our team provides brick estimates, take-offs, sample delivery and setup, and brick matching service throughout the Carolinas and over 30 states across the country. Between mobile ordering, online support and virtual design consultations, Triangle Brick is committed to being there for our customers when and where they need us. Customers can also access TBC Central for information on orders, invoices, inventory and more. Triangle Brick Company is proud to provide brick matching service, brick delivery and much more to residential and commercial customers in North Carolina, South Carolina, Virginia, Georgia, and beyond.